This movie won me over about halfway through. I did not come into Jack the Giant Slayer expecting to be grossly entertained. Jack and the Beanstalk is as well-known a tale as they come, told to most children not long after they’re capable of asking for bedtime stories. It is a Grimm fairy tale, one of a collection handed down through villages over generations to delight and frighten, moralize and instruct. Was this a grim and gritty reimagining of the children’s classic I was in for? Heavens. My mood was not elevated to see that in whatever magical kingdom the film takes place (Britain), despite the rigid class system, there is an astonishingly egalitarian profusion of modern skin care products. Whether peasant or aristocrat, everyone in this country has perfect skin. I mean, really, just flawless. Good teeth, too. Jack (Nicholas Hoult) even has his own leather hoodie. There’s a camera obscura too but that’s historically accurate, so no foul there, but Ian McShane plays the king so that’s another strike against the film for wasting Al Swearengen. The tale is what you’d expect: Jack is a well-meaning peasant, and as a peasant he’s destined to remain a peasant, tenant farming for The Man; Isabel (Eleanor Tomlinson) is a princess, and as a princess she wants to go on adventures, and escape The Man; once upon a time in the kingdom’s (Britain’s) far off history giants roamed the land and ate people and that was just terrible, but then through alchemy or black magic or God or rassafrassa the monks melted down a giant’s heart and made it into a crown to control the monsters. Eric the Great, Isabel’s progenitor, wielded the crown and sent the giants up their beanstalks, banishing them to the sky. Through a series of uninteresting hijinks, Jack gets some magic beans and he and the princess and a retinue of the royal guard are sent spiraling into the sky. Then the movie experiences a notable sea change. The first half of this movie is immediately forgettable. Jack is a well-meaning peasant, and that’s his character. Aside from keeping his mouth closed for a few seconds of screentime, Hoult can’t do much to improve it. As a protagonist he’s fine. But everything changes when we meet the giants. I did not know until the credits rolled that this was a Bryan Singer film. Singer is a great director (Superman Returns haters can at least agree that the action was good and the movie looks nice), and what he was doing behind this thing I haven’t the faintest idea. However, it may explain why the action in the latter half of Jack is so captivating, or why the situation becomes so interesting. The giants in this film, far and away from being crude monsters, are actually very sympathetic. I don’t mean they’re not crude, for they are; and they’re definitely monsters. But (and I do credit the superb computer effects for realizing the giants so well) their antagonism stems from a long history of banishment. They were no angels to begin with, but when Eric the Great’s crown comes back into play and they are forced to obey its wielder, this compulsion is at the core of their resentment of the humans. There is a very dark suggestion of slavery that doesn’t go much farther than that, but it’s fascinating. Meanwhile, the nominal bad guy (Stanley Tucci) and captain of the royal guard (Ewan McGregor) have an enormously good time playing off their hokey material. Tomlinson and Hoult are fair actors but their “romance” is entirely rote and, much like Elizabeth Swann and Will Turner in the Pirates of the Caribbean, it’s quickly submerged by the much more interesting story happening around them. When the giants finally land in the magic kingdom (Britain), their siege on the castle is exhilarating. 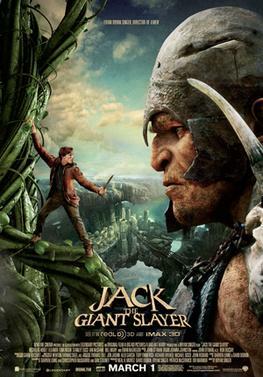 It’s a curious thing: From the moment a member of the royal guard is nearly turned into a pig in a blanket to the end of the film, Jack the Giant Slayer is fun and novel. Everything preceding that point feels like a much lesser film taken from a paint by numbers screenplay that is painfully self-conscious about “adventure.” Jack was delayed several months before coming to theatres and I wonder which side of it was given the polish.